Inside the city’s chicest new pop-up shop. Taylor is the designer and owner of Heather Taylor Home, an LA-based brand of handmade textiles. Spurred on by her own retail memories and a desire to create a physical space for people to experience her brand, she recently opened a pop-up shop on October 9. It’s situated in a gorgeous brick-lined space in a building that dates back to 1924—and that original charm is really the only suitable backdrop for Taylor’s carefully crafted, quietly sophisticated creations. She tapped her friend and event coordinator/stylist Amy Blessing to turn the historic space into something that feels like an extension of Taylor’s pieces. “I wanted the pop-up to feel like the kind of store you might stumble into in Paris or New York on a rainy day,” says the designer. 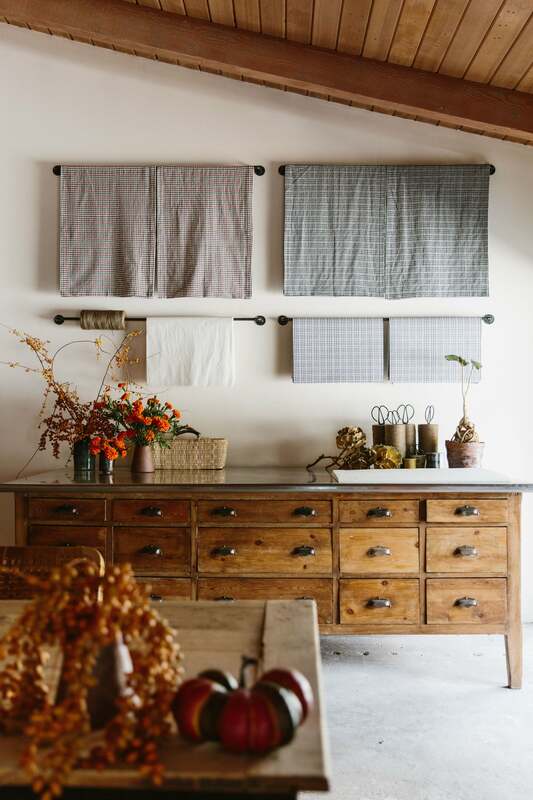 Filled with colors, textures, and patterns at every turn, from neatly folded piles of tablecloths on the built-in shelves to a fully decked tablescape in one of the shop’s sunny corners, the ambiance is anything but temporary. There is a mix of old-school character and fun bursts of color that marries classic style with a touch of laid-back California cool. Working in tandem with interior designer Sarah Shetter, Taylor brought in elements of LA culture, paying homage to her roots. Furniture from Brenda Antin (“an LA classic”), antique rugs from Lawrence of La Brea, and a smattering of plants from The Tropics. Despite the stunning backdrop and the local accoutrements, Taylor’s designs remain front and center. A just-released tabletop collection, which Taylor designed in partnership with Clare V, includes leather goods such as coasters, napkin rings, and placemats. The trending contemporary material is a juxtaposition between Taylor’s timeless and rustic textiles—and the combination of the two results in quite the stunning table setting. Which got us thinking: How might the textile designer and owner of LA’s newest boutique go about maneuvering a holiday table? We asked. And if you’re feeling stuck on how to make a table setting feel fresh for the upcoming season, you’ll want to keep reading. “I’ve basically filled the space with all of my favorite things, many of which I’ve been using for years,” says Taylor, pointing to notecards by Jonathan Wright, Moroccan baskets, hand printed floral ceramics sourced from Italy, and her favorite candles from Le Feu de L’Eau. While she offered up this tidbit in reference to her pop-up space, it’s a good lesson for decorating your holiday table: Instead of buying an entire new set of items, treasure hunt in your own home. Use a small woven basket to hold rolled-up cloth napkins or mix and match an eclectic bunch of previously-used taper candles for a dramatic centerpiece. If you do want to pick up new entertaining essentials (a hostess gift to yourself, if you will), steer clear of pieces that are clearly branded for the holidays. Put down the orange leaf-emblazoned plates and leave the red-and-green striped candles at the register. Invest in tabletop items you’ll be able to use year-round. Taylor’s dining room textiles are proof of this, highlighting simple patterns and faded colors. Sticking to an autumnal motif? Bring in the color of the season in a subdued manner with the handwoven Milos Goldenrod Runner, which bears just a hint of seasonal flair. Feeling something a bit bolder and glam? Taylor recommends the Soho pattern—a graphic black and white print that she says is a perennial favorite for holidays. Speaking of color, go unexpected. “I’m a real blue and white person—it never goes out of style,” says Taylor. While this combo may be something one might expect of a summer palette, it isn’t what first pops to mind when one thinks of holiday entertaining…precisely why we’re all for it. Let’s face it: You probably don’t need five different fork options at your holiday table. “One fork and one knife will usually be enough,” says Taylor, adding that she sticks to the casual essentials (beautiful linens, a few candles, and greenery or flowers) to round out her setting. The Heather Taylor Home Holiday Pop-Up Shop is open now through December 31 2018. Head to 1101 Glendon Avenue in LA’s Westwood Village neighborhood to shop and check out experiential events like wine tastings, wreath makings, and textile monogramming.